Today, me and my mother and brother went to Eastwood mall. Having pretty much no choice since all other places had long waiting lists or aren’t really appetizing, we chose to go to Uncle Cheffy. It’s supposed to be a brick-oven restaurant featuring panizzas and barbecued stuff. I have never heard of this restaurant before, and never heard of any recommendations from other people mentioning this. 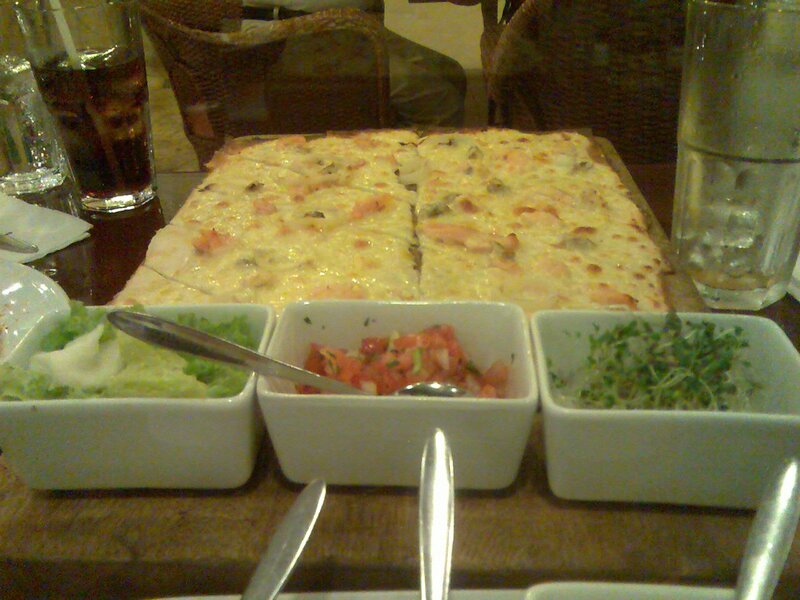 It’s also my first time having panizza, so it’s pretty much a blind-tongued experience. We ordered a couple of items from their menu that features their tagline—Memphis Barbecue US Beef Rib Fingers (595 Php) and Seafood Panizza (425 Php). We also ordered a couple of bottomless Iced Tea (70 Php). The beverages came first, and I must say, it’s not your normal instant iced tea—I could actually taste some of the soothing bitter tea in the refreshing beverage. The next that came were the ribs. For the price, it’s pretty hefty. 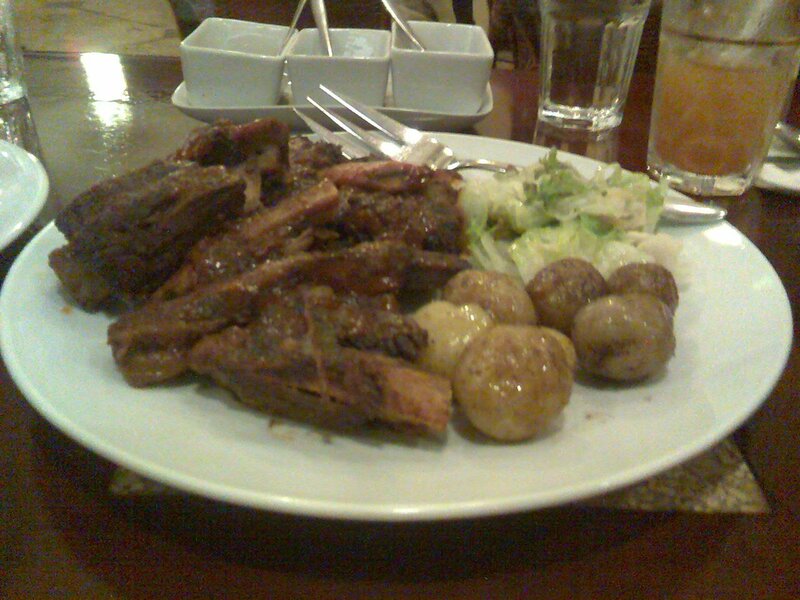 The reason we ordered this was the weight: it said that it’s a kilogram (a bit more than 2 pounds) of meat and bone. While the bone do consist most of the weight, there’s still a lot of meat in it, good enough to fill the three of us up. The meat was very tender, melt-in-your-mouth, and practically falling of the bone with a smoky barbecue taste. There were also some cherry potatoes and greens and vinaigrette, although I would’ve been happier with more. 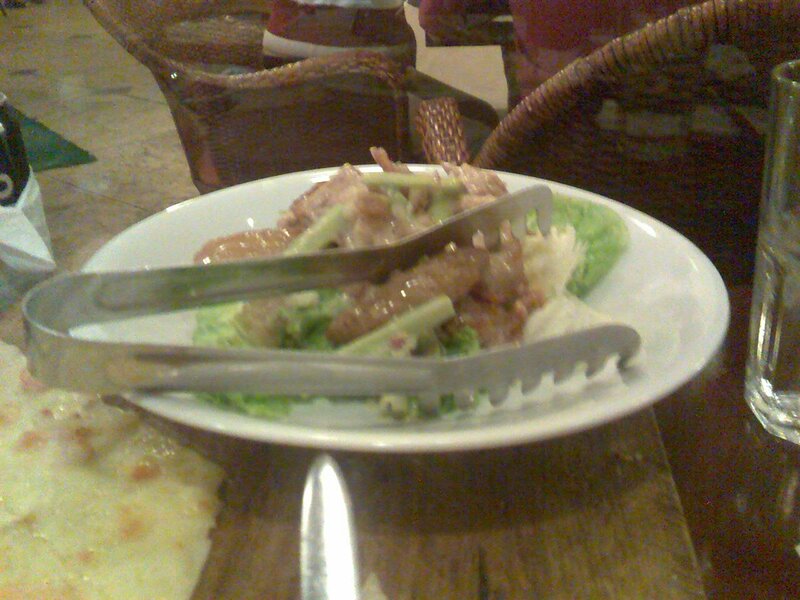 We ended up ordering their Cheffy Salad (230 Php for a small serving) to dilute the smoky taste of the meat. It also came with salsa, pesto, and barbecue sauce which complements the beef, although it can live without it. 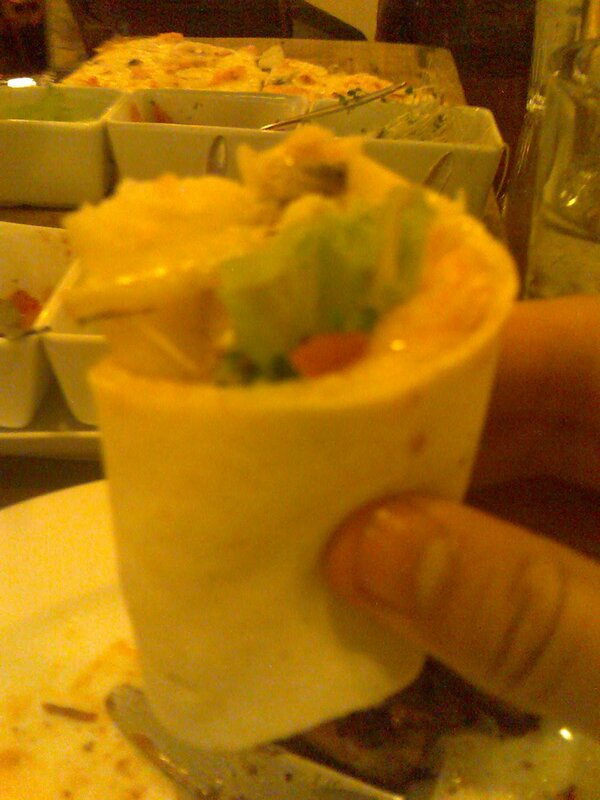 The panizza came next, and their servings were pretty generous as well. It’s a rectangular pizza with fewer toppings than your normal pizzeria, which I find quite nice. 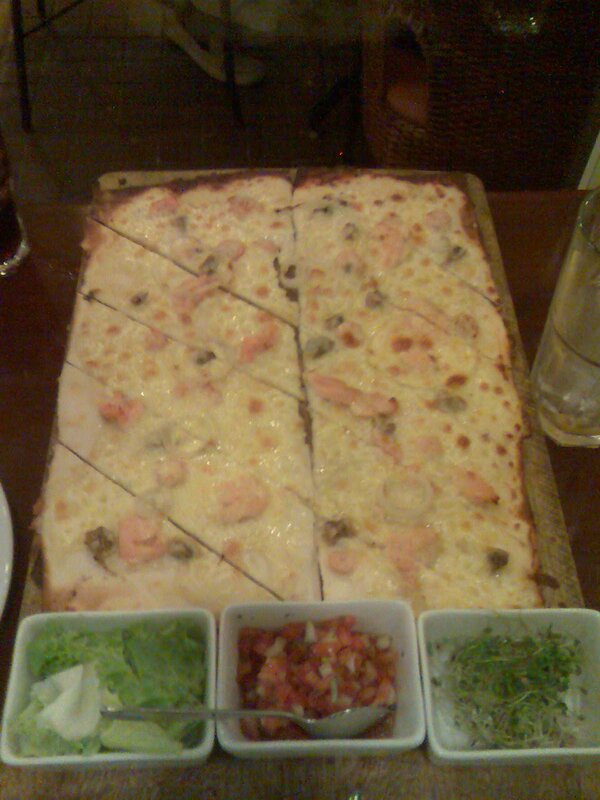 Our pizza had small chunks of seafood scattered throughout the cheese-covered crust: shrimp, salmon, and squid. It’s also cut into diagonal strips, the reason being the way it’s supposed to be eaten, although you can eat it like your regular pizza. As such. The dough is soft and not at all hard and crunchy, except at the edges, allowing such a manner of consumption possible. The pizza itself is quite good. While there’s nothing fancy about the toppings themselves, the softness of the crust and the texture of the cheese creates a balance that’s quite enjoyable to eat. It’s a pizza done right: not oily, not too cheesy, and not at all hard. It’s a soft, chewy, and well-balanced delicacy. Just right. The salad came last, since we did order it a bit late. We also sort of made a mistake ordering this kind of salad. It came with your usual greens, asparagus, and potatoes. What it differs from your usual salad is that it had pork in it: oily lechon kawali with a lot of the crunchy skin, the stuff that makes you younger with every bite. The pork was almost as tender as the beef, and the skin was as tasty as much as it was sweating in oil. Our bill amounted to 1,500 Php, not bad for the three of us, considering my brother could amount to two-and-a-half people. All in all, it was a good experience, and a good feast. While it may be a bit pricey, I find it worth it for the generous servings and the quality of the food. It was an enjoyable restaurant, and I would recommend this for parties of at least three if you’re quite hungry. The next time I go here, however, I’ll make sure to order greens or rice or potatoes if I would order meat from their menu. Recommended for: Meat and/or pizza lovers. Not recommended for: Non-hungry patrons. Smart nomnomnom tip: Order veggies/rice on the side if you’re having meat so that you don’t get tired of it.